Colored sugar is a baking wonder, used to embellish cookies and cupcakes with without having the sugar burn or melt. I was, however, aghast that it was selling for around P137 at Chocolate Lover (container size is slightly taller than McCormick spices). Good thing though that they're only selling for P30 a tub at Makro. Of course, not all Makro outlets may have them (or as many different colors to choose from). 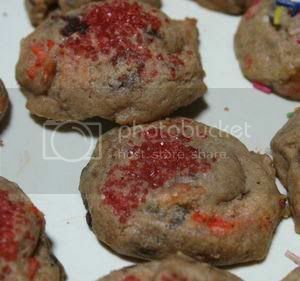 They're particularly wonderful when they're slightly 'burnt' with the cookie dough because they taste like cotton candy.